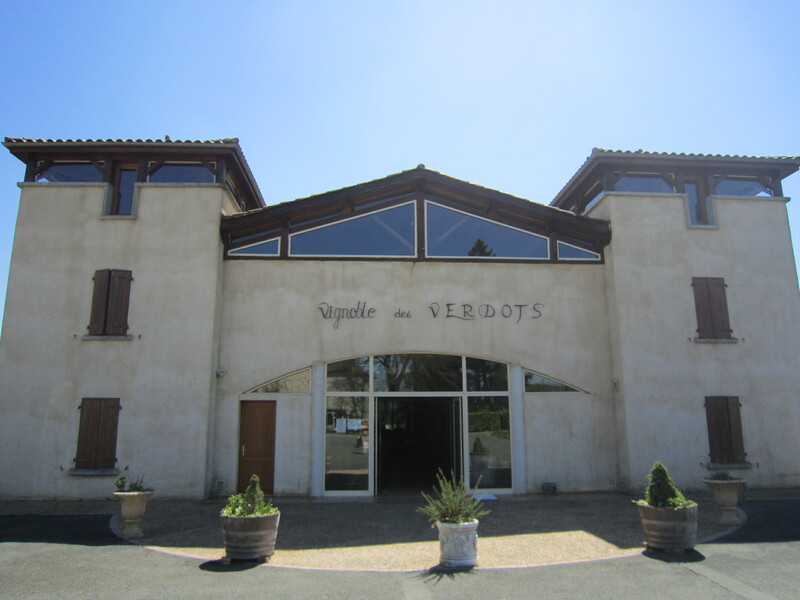 The tall and imposing Tasting Room is the first thing we noticed as we drove along the high plateau driveway to Vignobles des Verdots in the community of Conne de Labarde, south east of Bergerac and not far from the Bergerac Regional Airport. The building is contemporary yet monumental in style and makes a bold statement of optimism and confidence that mirrors the same characteristics of wine-maker and proprietor David Fourtout, named Winemaker of the Year 2012 in the Bergerac Wine Region. As we made our introductions and agreed in which language we would conduct our conversation and tour (English this time), we were conscious that the forecourt of Vignobles des Verdots was a hive of activity. A large truck arrived to pick up cases of wine and deliver them in Belgium, a couple drove up in their estate car to collect wine to drive home to the Netherlands and so it went on. This led to a discussion about the markets for the Verdots wine and David said that they sell their wine in 20 countries: 50% is sold in France and 50% is sold internationally with Belgium, Holland and Germany being key markets as well as the Scandinavian countries. We asked about sales to Canada: Vignobles des Verdots is sold in Quebec through SAQ, the Quebec Liquor Control Board; the buyers for the Ontario Liquor Control Board had visited the day before but sadly it has been a long time since any wine has been sold in British Columbia. David started our tour in the cellars beneath the Tasting Room and we descended to the large, cavernous area to see where the wines are aged in oak barrels. This cellar has exposure to the surrounding limestone rock through large openings that have been cut into the concrete on all sides of the cellar. The openings in the wall are backlit and the rock surface is both visible and touchable. 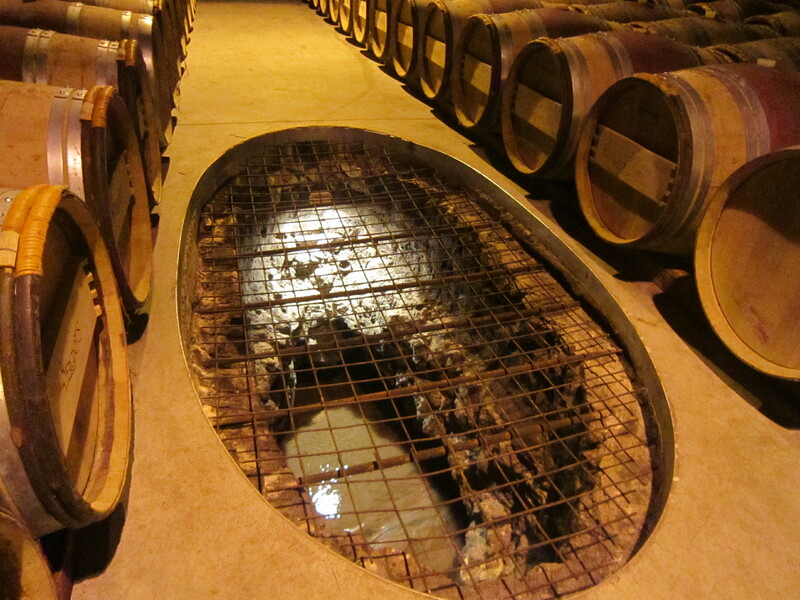 There is also a large opening cut into the floor, covered by a metal grid, showing the underground Verdots stream that continues on under the vineyard and nourishes the vines. The water is crystal clear and fast flowing over yellow-gold sand. We had an immediate sensation of being part of the earth, rock and ‘terroir’ of the place. We then had a tour of the winery or ‘Chai’ and were shown the investments that the Fourtout family has made in the purchase of various winemaking equipment as part of a process of continuous quality improvement. These investments are in addition to the recent construction of the Tasting Room and cellars. David Fourtout talked to us about his philosophy and approach to winemaking. He practices organic styles of winemaking. He prefers to remain flexible in his approach and use interventions according to the needs of the vines. Similar to the message we have heard in other wineries in the area, David emphasized that the use of sulphites, a natural wine preservative, has been much reduced at Vignobles des Verdots. Geologically and climatically, the area is simllar to Saint Emilion with respect to the soil but has more of a continental climate with colder weather in winter, hotter weather in the summer but less rain. We are always interested in the marketing and promotion of wines and found that David Fourtout is committed to these functions and, with others, takes a leadership role in the advancement of the Bergerac wines. He is currently leading a committee in the Bergerac Wine Region to look at the promotion of their wines including recommending changes to the appellation controlee regulations. There is an initiative to advocate changing the name of the Cotes de Bergerac appellation to Grand Cru de Bergerac to be reflective of the quality of these levels of wines. It will be interesting to follow this and see what unfolds. There is a virtuous circle of wine tourism practised at Vignobles des Verdots: from the five euro summer vineyard brunches and the significant farm gate wine sales in July and August to the B & B accommodation in one of the towers of the Tasting Room, there is a lot of promotional activity. All the family gets involved: his wife and his parents who also live on the property help out with the Tasting Room activity. His Father was the power behind the Tasting Room construction. 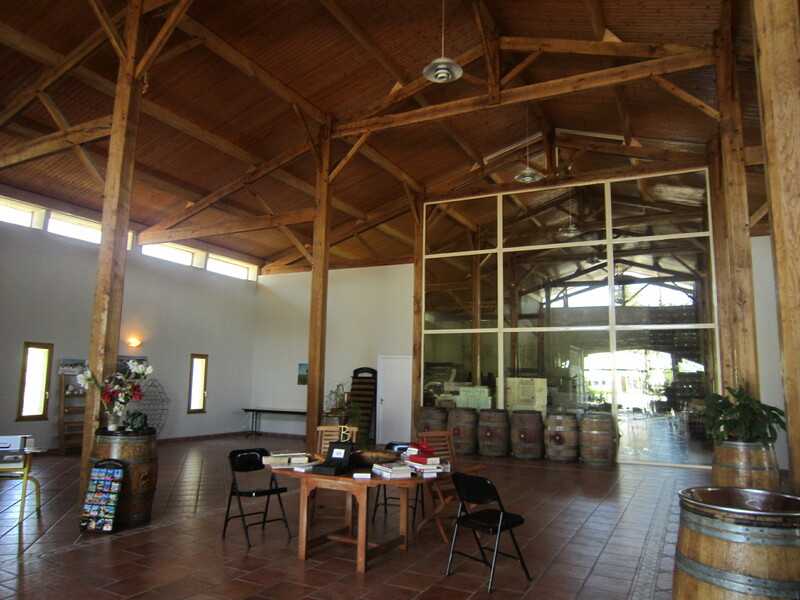 Talking about the Tasting Room…. we had a comprehensive tasting of the suite of Verdots wines. They make wines under 6 different appellations: AOC Cotes de Bergerac Rouge and AOC Bergerac Rouge, AOC Bergerac Rosé, AOC Bergerac Blanc Sec, AOC Sweet Cotes de Bergerac and AOC Monbazillac. These are blended wines from the estate and the red wines consist of predominantly Merlot with Cabernet Franc and Cabernet Sauvignon; the whites are Sauvignon Blanc, Semillon and Muscadelle; the sweet whites are from Semillon and Muscadelle; the Rosé is made from Cabernet Franc and Cabernet Sauvignon by ‘bleeding’ off the juice during the fermentation process; and finally, the Monbazillac or liquoreux wine is made by blending Semillon, Sauvignon Blanc and Muscadelle grapes that have been hand picked taking only those grapes which have been affected by the fungus Botrytis Cinerea also known as Noble Rot. The different wines together with tasting notes are well documented on the informative Vignobles des Verdots website noted below. 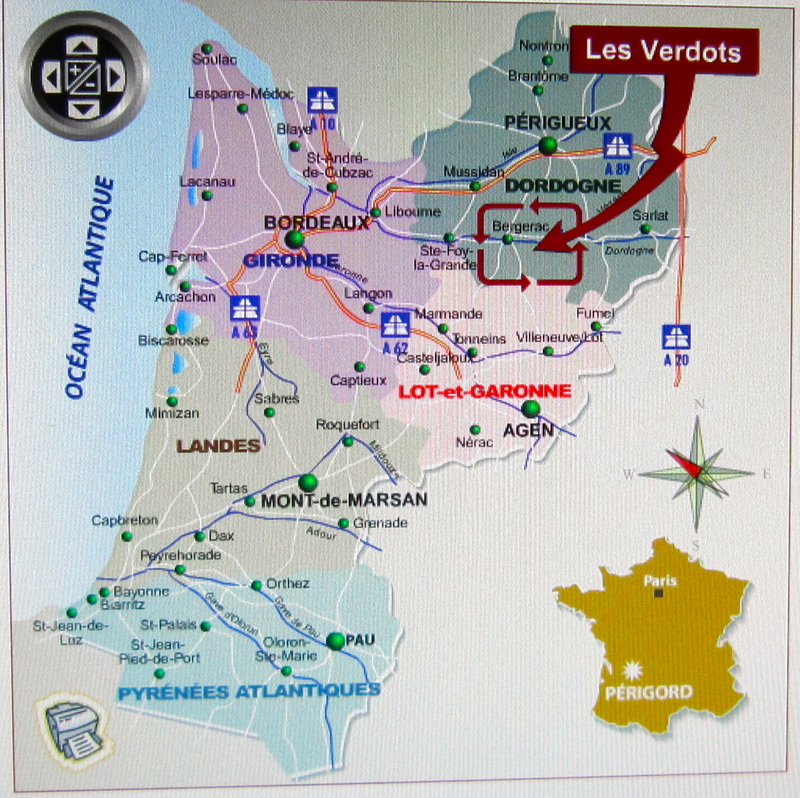 In addition to making wine according to 6 appellations, the Verdots wines are made in 4 different levels: Clos des Verdots, Chateau Les Tours des Verdots, Grand Vins les Verdots and Le Vin Selon David Fourtout. All the wines are of a high quality. For Canadian readers, the Chateau les Tours des Verdots Blanc is available through the Quebec liquor stores. 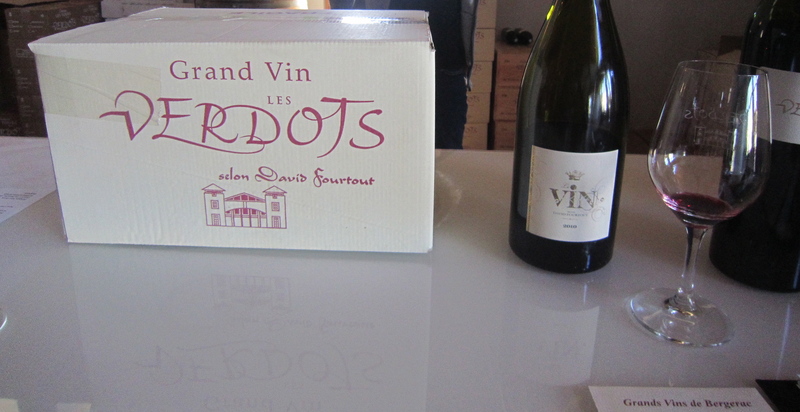 For us, the Grand Vin “Les Verdots Selon David Fourtout” was the most delicious: balanced, complex, textured and fruit forward. It has all the flavours and depth we enjoy in a Bergerac style red which, dare we say it, seems to us to be of similar quality and style but better value than its Bordeaux cousins. As we prepared to leave and say our goodbyes and thanks for an interesting and informative visit, several people arrived all at once to taste wines. David called over to his Mother to come and help. At its heart, this is still a family farm growing grapes and making wine over four generations with its focus firmly on the future. This entry was posted in culture, French Wines, wine tasting and tagged Bergerac wine region, Dordogne, French wine tourism, French Wines, South West France, Vignobles des Verdots, wine tasting notes by elizabethsvines. Bookmark the permalink. Félicitations pour ce compte-rendu de visite au “Clos des Verdots” et de rencontre avec D.FOURTOUT . Documenté, précis, exact , avec une approche personnelle technique et une grande perspicacité. Qualité du “wine-maker”, qualité des produits, qualité des commentaires (!) :tout cela est cohérent, signe d’une intelligence appétissante . A apprécier sans modération ! !